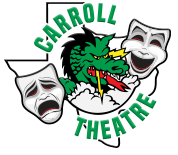 This form is for current Carroll Theatre students to submit their theatre activities for consideration for thespian points, in accordance with the Thespian Point System established by the International Thespian Society. Please note that the Thespian Point System is meant as a guideline for troupe directors, and Carroll Theatre may make adjustments to how points are awarded as necessary. Thespian points are used to qualify for ITS membership and may be accrued throughout high school toward graduation honors. Please refer to the Thespian Troupe Handbook for more information. Please print and complete the form according to its instructions. Or hover your mouse over the form pictured here and click the arrow icon at the bottom to download. For any questions regarding points or activities, please contact the Thespian Board.